Some of us like a classic rom-com on a Saturday night, others are partial to a comedy. The thrill seekers amongst us we prefer to sink our teeth into a psychological thriller. The type of film which will leave you racking our brains for an explanation. Or perhaps, a gory horror film? One with blood flying in every possible direction, staining our minds with these brutal scenes permanently. Horror as a genre sends a tingling down thrill seeker’s spines, sets our heartbeats racing. Yet, we can’t get enough. Thrill is at the root of our pleasure. “What enjoyment do you get out this?” Many people ask, we smile and say… it just excites us. If you are reading this, and thinking yes, this is my guilty pleasure then do not fear – or do! 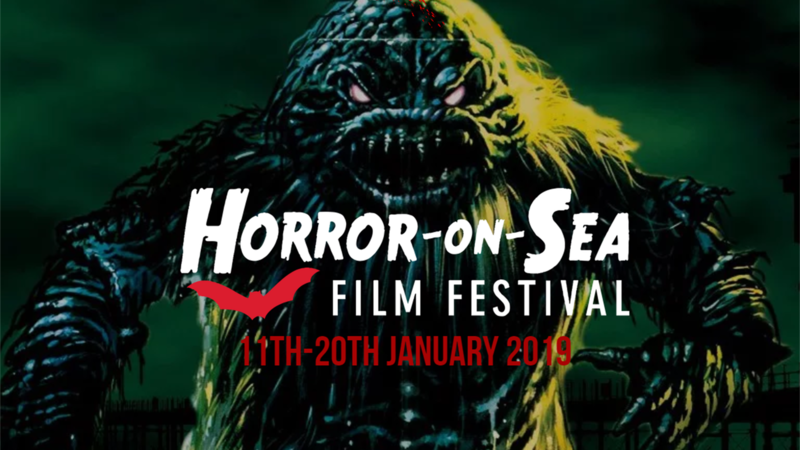 The seventh edition of Horror on Sea Festival is coming to Southend from the 19th- 28th of January. Not only will it show an array of the very best of British and international talent in the horror game. It is a good platform for all the up and coming directors, and actors hoping to make a name for themselves on the scene. The festival receives submissions from all across the world, America, Europe, India, and Brazil represented amongst the 30 feature films and approximately 40 shorts. As if that wasn’t enough, prices won’t leave you strapped for cash. passes start from £20 a day. The festival reaches out to all film fans but particularly catches the eye (or leg) of the horror enthusiast. The festival spans over two weekends, allowing screening from 10 am to midnight. It is a good opportunity for the horror geek to discover new films that perhaps may not have made it to the big screen. The inclusion of shorts, as well as films, opens up the doors for novice filmmakers and niche productions. Films such as Hell’s kitty, will screen. A supernatural thriller based loosely on true life events surrounding Nick, a Hollywood writer whose love life is jeopardised by his hellacious cat, with the juxtapositional name ‘Angel’. ‘Against the Night’, a psychological thriller that tests the boundaries of friends that sneak into an abandoned prison to film a ghost hunting video. Cotgrove, the festival creator, has a clear passion for horror films and the art that goes into making them. This is reflected in that fact that he does not charge an application fee, and hopes to continue not to for as long as possible. He tries to preserve the core of horror films, and why they originally were made: the root. He states that he ‘was into horror films before I knew what they were’. He has a lot of experience in the film industry, working for the likes of Disney, and also directing Green Fingers. I couldn’t think of a better person to encourage me to anxiously sit at the end of my seat! If you too would like to sit at the edge of your seat, for what we thrill seekers call amusement – be sure to check out Horror on sea’s fantastic weekends. With all of these credetials, you are unlikely to be disappointed by this creative insider. Over the years humans have developed a fight or flight response as an inborn defence against nature. Horror films activate this reaction. It is the root of our defense, how we protect ourselves. For example, to evade predators. A scary movie can be very satisfying as in most cases the villain is defeated. This gives us a sense of triumph. It seems many of us at the core, or the root, enjoy the thrill that horror films give us. Despite your instinctive conclusion, your guilty pleasure according to psychologists is actually quite normal. In fact, it is also healthy. As with all things of course, within reason. So, if you want to get your ghoul on, with thousands of other supernatural, gore-loving fans, Horror on Sea is not to be missed.